Saalbach and its close neighbour, Hinterglemm, have united in the picturesque Glemmtal Valley to form one of Europe's liveliest ski resorts, which is particularly popular with Dutch, German, and Scandinavian holidaymakers. The valley sides offer numerous ski slopes, but its low altitude means that snow conditions can deteriorate quickly. Nevertheless, the resort has excellent snowmaking equipment, which ensures good coverage in the sunshine. There are more than 125 miles (200km) of ski trails linked by lifts, mainly suited to intermediate level skiers. There is, however, a two-mile long (3km) expert mogul descent on the north facing Zwolferkogel, and more than 60 miles (97km) of off-piste terrain. The pretty Tyrolean-style villages are fairly new, but the ambience is traditional, with chalets and sleigh bells adding to the charm. 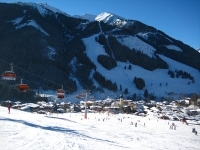 Saalbach has a circuit of 168 miles (270 km) of prepared pistes, easily accessed by an excellent network of modern lifts. The north side of the valley offers a variety of beginner terrains, dotted with T-bars. There are 13 ski and snowboarding schools in the area, so tuition is readily available. Intermediate skiers are also well catered for with an extensive area beyond the Reiterkogel. Schattberg Ost, Schattberg West, and Zwolferkogel offer some challenging north-facing slopes, with the north face of the Zwolfer providing a harsh black run. Nearby Leogang offers a remote, demanding ski area, reached from Vorderglemm by the Schonleitenbahn gondola. There are some spectacular off-piste powder runs on the north side of the valley. The resort is also extremely popular with snowboarders, with a massive terrain park reserved for boarding at Hinterglemm, and some half-pipes at Saalbach itself and neighbouring Leogang. Hinterglemm is the best place to shop in the valley because its stores are frequented more by locals, who are averse to paying tourist prices. Saalbach's pedestrianised High Street has several attractive boutiques and shops where holidaymakers can enjoy a spot of shopping, but prices are higher. Good buys to browse for are Austrian sweaters, hardware, cookware, and kitchen gadgets. Woodcarvings make good souvenirs and art pieces with Alpine motifs are also popular. Of course there is a great selection of ski gear on offer. If you happen to be around at the end of the season, you are likely to pick up a few bargains, as skis and other equipment go on sale. Rustic Alpine inns serving up hearty local fare to holidaymakers in Saalbach rest on the slopes, while the valley towns bristle with restaurants, cafes, ice bars, and delicatessens (for those who enjoy a 'do-it-yourself' meal). Most of the inns open from breakfast time, tempting skiers with delicious Austrian pastries and coffee. Hearty lunches and dinners focus on a huge variety of local pork and sausage dishes, including schnitzel. The local establishment that is reputedly the best of the lot is the Pfefferalm , an historic chalet, located on the Reiterkogel blue run. So hectic is the après-ski in the Glemmtal Valley in Saalbach that it is surprising any holidaymakers can muster the strength to hit the ski slopes in the morning! Copious amounts of excellent beer and schnapps flow in the mountainside inns and village ice bars, along with some rollicking music and good-natured gemuchtlikheid. Dancing on the tables is expected and drinking anthems with cries of prost! echo everywhere. Most parties get going even before the ski lifts close at 4pm, in the chalets above the villages. One of the most popular mountain bars is the Goaßstall on the Hinterglemm side, which features indoor and outdoor bars and live, as well as artificial, goats that hit the dance floor among the glitter and fake snow. Another favourite is the Spielberghaus, which is reached by snowmobile along a four-mile (6km) track through the forest. Revellers are then transported home on high-speed sleds. In the villages there are a dozen options for late night fun at hotel bars, piano bars, beer halls, and clubs. Discos get going at around midnight and keep the pace until the early hours. Apart from skiing and snowboarding in Saalbach at all levels, the twin holiday resort villages offer all the expected winter sports activities. Choose from snowmobiling, snowshoeing, ice-skating, tobogganing, ice-climbing, and snow-hiking, to name just a few. The historic Austrian city of Salzburg, birthplace of Mozart, is just an easy hour's journey away and makes for a great excursion. The valley also boasts a host of activities that are on offer all year round, like archery, fishing, horse riding, paragliding, and golf on a nine-hole course, while children are exceptionally well catered for. Folk evenings, brass band concerts, and street painting are scheduled in the summer months when more than 249 miles (400km) of walking trails open up in and around the valley. Saalbach can be extremely crowded over the Christmas season.